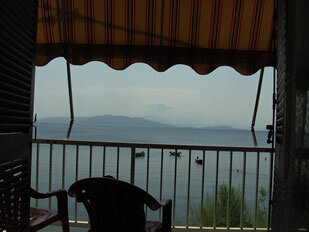 and the Aegean Sea, and back to Lefkada, 2009. Planning 2009. Departure from LEFKAS early May - Ithaka - Mesolongi - Patras - N.Trizonia - Galaxidi / Itea - Korinthos - passage of the canal - Aegina - Cape Sounion - Olympic Marina / Lavrion - N. Petali - Voufalo - Chalkis - passage bridge Chalkis (at night) - Limni - Orei canal - (a) - (b) / (b) - (a). [ follow the full red line on the chart ] a.) 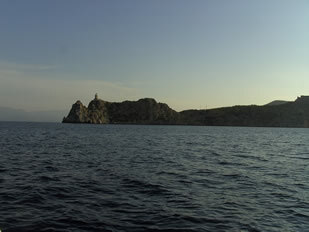 Pagasitikos Kolpos (gulf of Volos) - Horto [39°11'20N 023°12'70E!] (b.) N. Skiatos - N. Alonisos -N. Skopelos (finally we decide not to sail to the North-Sporades); departure fron HORTO to Lefkas Marina: at the end of August. Overview and information about the harbours. 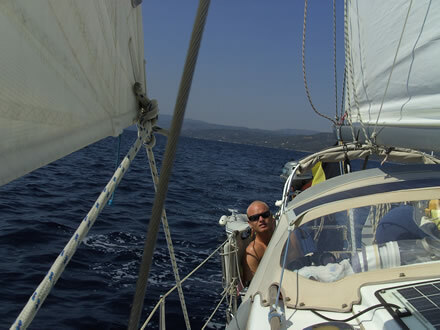 07.05.09: Lefkada > Vathi (Ithaka), 30nm, 10H15-16H15. 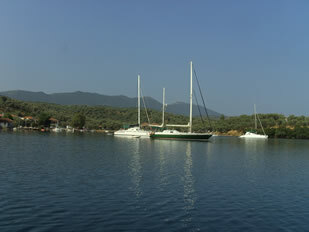 At 10.15 a.m. we leave Lefkas Marina for a long summer trip that should bring us to Hortó the aim of our project. We have met Wil and Jeanine from the Windswept since they are back in Greece. They want to visit Greek friends in Limni, on the NW coast of the island of Evia. For a large part of the trip we will sail together, each boat - the Windswept is a 40 footer - according to his own rhythm, each crew by their own choices. But the fact of sailing together is a not to be sneezed safety factor and a very nice surprise! From Meganisi to Vathy, we get a wonderful by the wind sailing. Approaching Ithaka the wind is freshening. As indicated in the pilots, navigating along the NE coast of the island is a quite windy affair. We avoid the worst winds by not sailing to close to the coast. Vathy lies deep in the small, rather narrow Kolpos Aetou. The high mountain flanks of the gulf and the bay surrounding Vathy, create sometimes a violent katabatic wind, particularly on the north side. This early May it is still very quiet in the little harbour. No trace of the hyper-busy summer fever. Road works give it now a bit dusty look and many restaurants and shops are still closed. As so often in Greece it's difficult to start working again after virtual inactivity. When we are looking for a restaurant far from the quay and the dust, there are only few who try to win us for their restaurant. In a quiet alley we find a small, nice taverna where we as the only foreigners are served by the owner. As thanks for our visit, we get a nice but very sweet dessert - she probably will not do that during or after the busy summer season, when the money from tourism is earned! 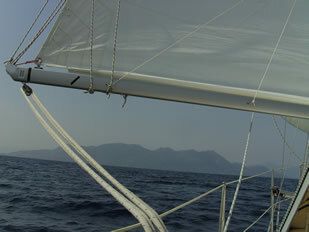 08.05.09: Vathi > Messolonghi, 38NM, 08H30-16H15. Unfortunately there is not enough wind to cross to Messolonghi sailing; so we have go motor sailing for 30 NM. We have carefully prepared our arrival. The lagoon of Messolonghi is extended over more than 16 NM from cape Skrofa - Akra Skrofa - east of the island of Oxeia - Nisos Oxeia -, to cape Evinos - Akra Evinos - east of Messolonghi. The 2.5 NM long approach channel going through the shallows, is marked by starboard (green) and port (red) buoys, which are difficult to distinguish by the reflect of the bright sunlight on the steel-blue water. We have put there a waypoint but there even less than elsewhere, we do not have too much confidence in either our GPS position nor in our electronic chart. Time will concur! It's not very busy in this harbour, situated in a large water surface laying just behind the coastline. The only larger vessels that come here are coasters coming at irregular intervals and loading the salt brought here by truck from the salt works nearby. In the western part of the harbour an unfinished marina is dying. But, perhaps, there is some hope ... A new Greek-Dutch investment would resume the works, this time with the determination of building and managing, in Greece, a new marina (www.messolonghimarina.com). If on arrival in this very dusty "marina" Messolonghi seems very disappointing, our impression will change when visiting this rather small city. 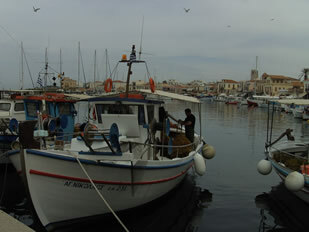 At about 15 minutes walking from the harbour, the centre of Messolonghi is very lively and pleasant. We will stay one day more as we will meet Guy Toussein, our sailmaker specialized in sprayhoods and covers.He made for our boat not only a spray hood and a bimini top but also a efficient cockpit tent that makes our boat bigger and more comfortable in the winter, as we have now our terrace! He is sailing with friends from Turkey to Italy. We also now have time visit to the small but charming Diexodos museum where an exhibition is dedicated to the desperate and heroic struggle and outbreak during the occupation of the city by the Turks (1822-1826). In the streets of the pedestrian zone and at the central square with the large fountain it's nice to stroll. Nearby we find some pleasant terraces et restaurants too. 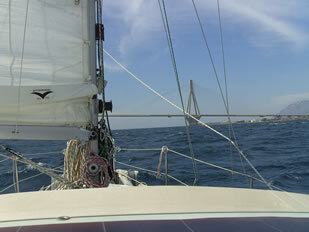 10.05.09: Messolonghi > Nafpaktos / N. Trizonia, 25 + 11NM, 08H30-17H00. passage instructions: we have to pass the southern passage between the pillars M1 and M2. At 12H40 we sail under the impressive and recent construction. At starboard we have a beautiful view of the coast of the Peloponnese, where the high mountains - and even those on the mainland, at our port - still have snow. After the passage of the bridge, we are heading for Nafpaktos, where in 1571 the famous Battle of Lepanto - Lepanto was the name the Venetians gave to Nafpaktos - brought the Turkish march to the west to a halt. The NNE wind is freshening, up to 20 kn [ap.]. 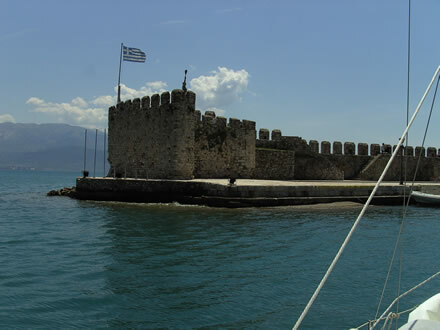 13H50.Nafpaktos. The small and charming oval shaped harbour is partially silted at the foot of the western Venetian tower; the rest of the harbour is crowded by small boats. We are prepared for a hypothetical stop because there is little room to manoeuvre. No sailboat is now moored here. Berthing beside the central steps seems the only possibility, but we are not really convinced. The harbour does not seem very secure in case of south winds and by heavy weather it would be untenable here really quickly. Good to know, we think, and satisfied with this brief exploration, we decide to proceed to the small island of Trizonia, 13 NM east. Trizonia is into the wind so we have to tack, but soon we give up, as we make no enough progress. The wind is to gusty, to irregular, and Nehalinnia is really not a high-close-to-the-wind-sailing boat - our boat can sail at say 43° to the wind, in optimal conditions we got once 38°. We cannot sail close enough to the wind for approaching the north side of the Gulf of Corinth - Korinthos kolpos : so we start the engine and are motorsailing by long tracks. 5 o'clock p.m. We moor in the harbour of N.Trizonia. There has been an attempt to build a marina in the northern part of the deep and well protected Mesa Limani bay, on the east coast of the island. But there is neither finishing nor real managing. The basic infrastructure - the concrete wall and the quay, the pontoons - is in poor condition, the concrete is in very bad condition, full of concrete rot, flaking off. The rare water facilities and connections - we count two, one with a padlock - are damaged. Many berths are occupied by longstayers, whose boats are visible aging, some are already in a sad state. A big ketch has sunk in the harbour. Some sailing boats are on improvised laid moorings. There are also several sailboats in transit. It could be quite different here: a nice place, a well-runned marina. But like many times in Greece, it went wrong, a waste of money and an embezzle of the European subsidies. The immediate surroundings of the harbour of this small and charming island are just as the marina itself. On the north-east side of the island, on the other side of a narrow piece of land, which further on also constitutes a kind of small peninsula, several tavernas and a mini-market are huddling together around the old little fishing harbour. One of the taverns is offering Internet service. In the restaurant where we'll eat tonight, we can get water and use the water hose for shower. The only hotel on the island, where sailors can take a shower, is still closed. In consultation with Will and Jeanine we decide to stay one day more at Trizonia. In the morning, we make a short update for the website; after some maintenance we go to the mini-market for a few provisions. During a walk to the south-eastern point of the island we come along Lizzy's yacht club, closed and for sale after 15 years good service given to cruising people, after the sudden death of Alison Fraser who was running this by sailors well known meeting place. 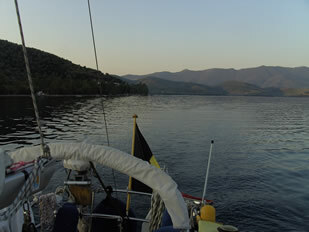 12.05.09: N. Trizonia > Galaxidi, 20,7 NM, 08H30-12H45. We have two waypoints plotted for trip to Galaxidi - a first one at cape Psaromyta a second one at cape Andromachi; thereafter it's the entrance of the Krissaios gulf. 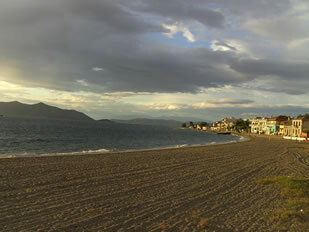 At the west side, Galaxidi, then at three miles to the north, Itea. We sail to Galaxidi: despite its little sophisticated and being more expensive reputation, it's more charming than Itea, bigger and more boring, with his rather new harbour and the-still-never-working-equipments! Here are many shaols and small islands, so navigation has to be done carefully. Our position on the electronic chart is wrong - like it was on our arrival at Trizonia, and many times we are sailing on land! A large grey-white square stone, with the painting of a dolphin on what is for us the backside, is a beacon for the save heading. The quay of Galaxidi is now completely finished and well equipped with water taps and current supplies (5 euro a day) and the village is well kept, so we decide to stay one day more. The in the afternoon threatening thunderstorm was disappearing when in vain we were looking for an authority that could give us a certificate of being in Greece: Kaat has to be president of a polling station for the elections on the 7th of June and she has to prove, already now for organisation matters, her absence from Belgium. With Jeanine and Wil from the Windswept - since Lefkas they are on the same way and many time we go together for dinner - we have this night a very nice meal at restaurant To Barco tis Maritsas - a restaurant in retro style, on the quay, worth a visit as we can believe our Guide du Routard. After a traditional tsaziki and refreshing salads, we savour a nice fish plate - not cheap, but once isn't custom - with a fresh white local wine, before we were offered by the restaurant a dessert as varied as surprising! Nice and pleasant weather. Diesel is delivered by mini-tanker. Then we go back looking for the police. The office is still closed despite the morning opening hours! We decide to go to the town hall, the dimos. Our visit will be (again) an other but instructive experience of the inefficiency of the Greek bureaucracy. Five times we have to explain our problem before we get with the help of a young, little English speaking woman - the only one active working employee in that small town hall - the signature and seals of the antidimarchos under the certificates Eric had prepared. That they also send the certificates by fax to the town hall in Nieuwpoort-Belgium makes our victory even bigger! 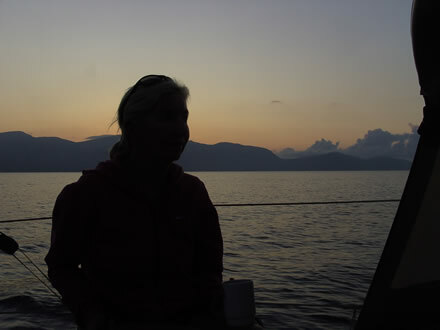 14.05.09: Galaxidi > Korinthos, 37,4NM, 06H45-14H30. A little longer sailing - course 135° - to the E-side of the Corinth gulf, where the gulf the bay of the same name becomes. 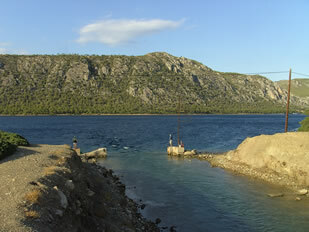 Just on the north of the city is the entrance of the canal that provides access to the Saronic gulf and the Aegean Sea. At 02.30 p.m. when a rather heavy wind is raising, we moore inside the small harbour of Corinth, just before Windswept, the boat of Wil et Jeanine, on the beginning of the starboard jetty. There is little space in this small harbour and no organised management at all. The biggest prudence is required because of big stones, blocs of concrete, buoys, moorings and improvised laid moorings laying around everywhere and are not easy to see. In the middle of the S-quay, separating the yacht harbour and the deeper inside small fishing boats harbour, mooring can be dangerous for a sailing boat with an average draft due a big immerged stone. We have called Christos of the Joana and in the later afternoon he comes to visit us; our Danish friends of the Concordia, on the way back to Barcelona, enter the harbour at 04.45 p.m. This evening we go for dinner to the new and very neat restaurant Mediterané. 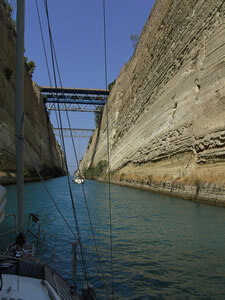 The moment to say goodbye is coming soon because tomorrow -early we hope - we would like to pass the Corinth Canal. 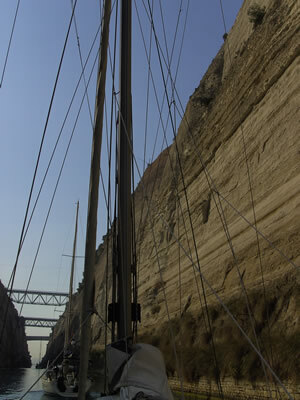 15.05.09: Korinthos > Corinth Canal > N. Aegina, 27,2NM, 06H45-14H00. From the harbour we call at 07.45 a.m., on chan. 11, Corinth canal control; we are lucky because we can proceed to the entrance. When we pass the breakwaters the lights are green. So, behind an other Belgian sailing boat and Windswept we start our progress through this 6 km long canal to the Saronic gulf , while in our back the road bridge reappears out of the canal water, restoring the interrupted traffic. The canal is only 25 m wide so in the pale light of the early morning the walls seem to be even higher. A weak current takes us in 35' to the exit at Isthmia, where the control tower and the tax office are located. Mooring there is difficult for our small sailing boat because the quay is high and there is an open overhanging. There is also one knot current pushing us, so we prefer to moore alongside Windswept. The tax formalities require also a lot of disconcerting paperwork and we have to show the boat papers. The Corinth Canal has the reputation to be the most expensive canal of the world - Greece is still honouring the nickname of tax-greedy nation! For our 8,50 m boat we have to pay 95,20 euro, a 12 m boat will pay more than 170 euro! But however, the canal passage is faster and safer than going around the very windy Peloponnesos, or is less risky than dragging the boats by the ancient dhiolkos, the paved road, like the ancients used to do! We put some waypoints on our chart tracking our road to the very touristic island Aegina, passing north of the Diapóra islands. Then we sail between the mini Moládi islet and the little larger Ypsili isle and after that we sail along the submarine exercise area - but always outside of it! A little before 2p.m. we enter the harbour of Aegina-town. We moore just behind the entrance , at the S-quay, in front of the yacht club, where we hope to find more quietness than at the N-quay, too close to the tavernas and restaurants but also to the road. Unfortunately the weekend brings a lot of small and large Greek motor yachts. A kind of unpleasant bustle is reigning in the harbour and on Saturday we are squeezed by very boor motorboat owners. We are not the only ones to protest against the impoliteness. When a violent dispute broke out between the congeners, some more delicate Greeks insist that we can not generalize our opinion, they keep their distance toward the group of barbarians and are strongly disapproving their attitude .. Are we now able to say not only: we have also seen happy gypsies ... we also met polite Greeks ... ( the title for an new in Greece filmed story - ours perhaps?). We decide to stay at least until the end of the weekend at Aegina, because it's not only a pleasant place and with Wil and Jeanine we discovered a excellent ouseri - "Tsias" - where we have dinner, but on weekends it's better not to move. We take advantage of our stay to visit the ancient site and the museum. From the Neolithic period to Byzantium the area was inhabited; the small museum shows many testimonia from the different periods. Mainly the decorations of pottery illustrate the succession of cultures. 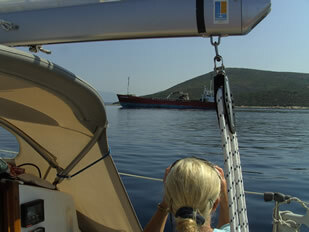 18.05.09: N. Aegina > Vathy (Chersonisos Methanon, Peloponnisos), 12,3 NM, 09H20-12H15. Strolling towards the volcanic peninsula Chersonisos Methanon on the Peloponnese. When we arrive at Vathy a flotilla leaves the harbour, so that we first have the harbour only for us. A little later Windswept enters into this very nice, small harbour, in fact the first since we arrived in Greece, like we dreamt of it. At the end of the afternoon four (charter) sailboats arrive. But the pleasant quietness remains, a real relief after the very noisy Aegina. The young owner of To Limanaki, one of the four restaurants, offers us a coffee for welcome. We can also make a free use of the bathroom of a room she rents. The delicious fresh grilled fish she serves for dinner and the cold house wine she offers as a mark of hospitality, make complete the unexpected delight that this place provides. Kostas also, the harbormaster, is a nice man, doing his job very well. How different pleasant is it here, finally! Soula of To Limanaki is right after all: in this little village there is still some mildness like it was, once again! A one hour and a half walk along the beach, then to the ancient Akropolis (wall) and Megalochori. 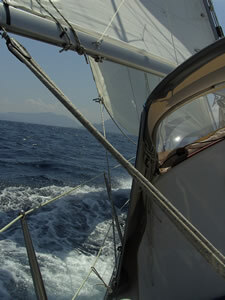 A very windy day: the forecasted strong winds - up to 7Bft in the Saronic gulf cause violent gusts here. By a strong gust on the back side of our boat the bow touches briefly the quay although our stern anchor, a Fortress 16, was very good holding. The squall did dragging our anchor during a fraction of a second. A small chip of paint on the concrete is the result. Kostas proposes to moore our boat along the small pier. 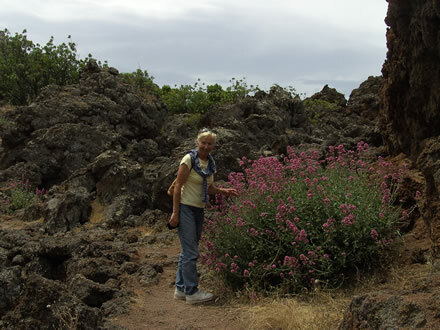 Before our walk to the old volcano - Soula's husband brings us by car to the start of the climb. 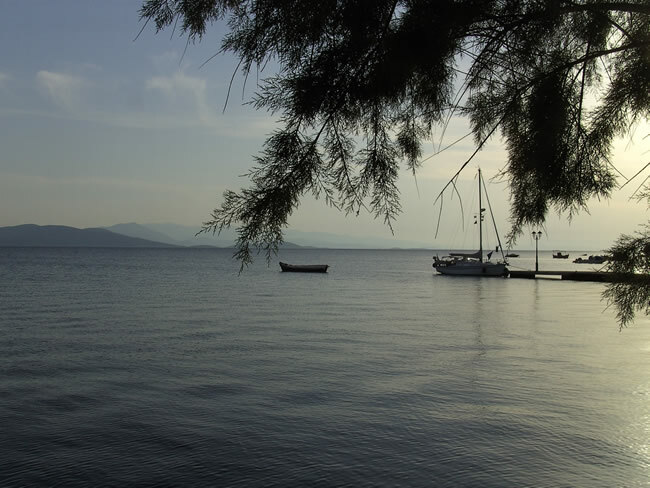 In the early afternoon we a walk of one hour brigs us back to the harbour - according Kostas' advice. The walk to the volcano was impressive: our pictures are the witness and souvenir of this nice trip. 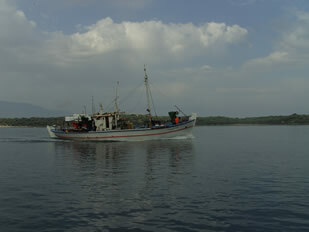 23.05.09: Vathy (Chersonisos Methanon, Peloponnisos) > Olympic Marina (Lavrion), 40,7NM, 07H10-15H25. From the north of the Chersonisos Methanon peninsula we head to the east to the famous Cape Sounio, where the temple of Poseidon is located. Although there is less wind we can unfurl our high aspect sail and we reach an average of 5,5 knots. In the Saronic gulf there are many variations of the current - well indicated in our Elias' pilot -, so at some moments we go SOG 6 kn but at other hardly 5 kn. We are passing just S of the Piraeos VTS entrance and exit. So, we have to keep a very good outlook here because large vessels are arriving rapidly and some fishing boats are very busy. At a moment we have to divert, following a SE course to give way to a giant; a little later we can change course again eastwards. By the binoculars we discover Athens and his harbour Piraeos. At about 2 p.m. the cape and the temple appear: an impressive view ... we sail closer to the coast to bring an offering to Poseidon - after several visits to the sanctuary as landlubbers - asking this god with the very changing mood protection and save navigations ... in Kaat's opinion the view is more impressive from the cape. But we are at fully daytime, the sun is shining high in the sky, and Olympic Marina, where we hope to berth, is at 5 NM. One hour later we get a positive answer on our call on channel 9, and we enter into this marina, renowned ... but expensive! As we can believe the brochure the marina could satisfy al our expectations and it seems to be very secure but according the good greek habits it presents already signs of too early ageing: being seriously doubtful, we want to believe that once upon a time, it was perfect ... but nothing is less sure. 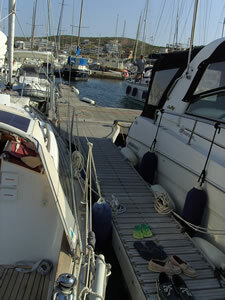 There are guards and a magnetic key is needed for access to the pontoons. The staff is very kind but we cannot feel something else than a deception: the super yachts we had imagined are very scarce, no large crews - this is far from what we saw in Italy in Cala Galera! - most of the buildings are empty. In the only one café-restaurant the menu is very limited despite the rather high prices -we pay 5 euro for a glass of white wine with our meal ! - and there is no other restaurant choice because Olympic Marina, its grounds and shipyards ( building of a 42', in partnership with Jeanneau ... in the past ) is really located in a desert! 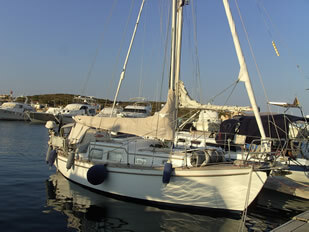 24.05.09: Olympic Marina (Lavrion) > Voufalo ( N. Evvoia), 38,7NM, 08H00-15H45. There are no real good harbours before Chalkis: so our destination is the as a good shelter known anchorage near the village of Voufalo. The southern part of the gulf of Evia is known as rather windy and is able to make navigation difficult in short seas for a small boat but today we don't have to worry and we can progress without problems. Voufalo. When we anchor in the early afternoon in 6m water in the NW of the small bay - a wreck makes anchorage more to the E risky - this is the time of our first swim of the season. When Eric checks the holding of our anchor, we are lucky because it has a good grip in the sand, as there is much weed offering poor holding. The bay is mentioned as a good shelter in both pilots; and it's a charming and quiet place. On the top of the hills large windmills are turning quietly but according the pilots we'll have no worries about downhill gust. We go for dinner with Wil et Jeanine from the Windswept, to the only one taverna serving meals this evening: nice gavros - these small fried fishes -, a greek salad - the choriatiki - and a tsaziki - yogurt of cucumbers, garlic and olive oil. There are no other yachts but some tables are taken by Greeks and the owners of a camper have found here an ideal stop for the night. During the night suddenly the wind comes up and our NAVTEX receives a "prob. thunderstorm soon" message for S-Evia, but except some nocturnal anxiety we get no trouble. 25.05.09: Voufalo (N. Evvoia) > Chalkis (N. Evvoia) 28,5NM, 08H00-14H25. At the opposite of our sailing trip yesterday, our start today is rather rough: wind on the bow, our progression is rather difficult in short seas. 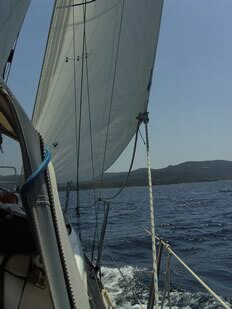 We are tacking under engine and mainsail, because there is to little wind to keep some reasonable speed, and the capricious wind doesn't allow to sail under the high aspect foresail. The situation becomes more spicy due the presence of two Canadairs making exercises. When we have Ag. Apostoloi midships on port, the sea is easing and we can steer a course to Chalkis. At the approach of Chalkis from the south the first starboard buoy of the channel is not easy to find but it's very important to keep clear of the shoal. Further on we pass close to the well conspicuous cement factory on our port, just before the new road bridge. A few big ships are waiting on the anchorage at our starboard for their load. At the passage under the new bridge the channel becomes even more narrow. Then appears deeper in, at our starboard the yacht harbour of Chalkis where developing works are going on. We moore at the new - very high - quay, left from the entrance, because the new pontoons are not yet quite finished. 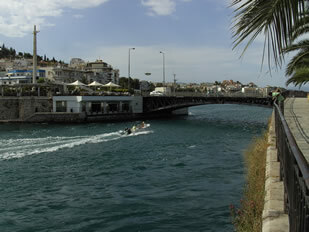 Chalkis town bridge opens only at night, at the edges of the streams. With our boat papers we go to the port police office to ask when the bridge will open this night and to pay the passage fees, for our boat, of 18,20 euro. We are lucky: tonight the bridge will open at 22H30. After an early dinner at the first ouzeri on the waterfront coming from the yacht harbour - Sto Teloneio -, we walk back to our boat because we have to be stand-by from 21H30 on VHF chan. 12. At 22H00 the port-police calls us and invites us to come closer to the bridge. Four yachts are going north, one yacht, going south, will pass at first. The whole operation seems to be well organised and controlled but we know that some yachts had to remain stand-by three or four hours before getting the passage authorisation. In his pilot D. Elias explains this particular situation of streams. The water that we saw during our meal running like a wild river through the narrow passage - five to six knots is not an exception - is suddenly calming down and a few minutes before 22H30 we see the bridge turning. The passage take less than half a minute and many people come to see the show, when it's not in the middle of the night. At 22H45 we are moored at the north quay ... just a little further than the very animated terraces, alongside Windswept. It's Monday night but on the quay it's still very lively.With a glass of cold white wine we celebrate our passage and comment the last day. 26.05.09: Chalkis (N. Envoi) > Limn (N. Envoi) 21,5NM, 09H35-14H00. After some shopping and provisions we leave Chalkis. 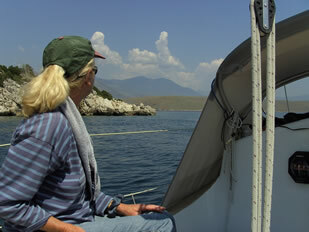 The clouds disappear rapidly and under a nice blue sky we are sailing along the NW coast of Eva island. The coast is steep, the hills, rough, falling in the sea. There are only rare villages along this coast, no beaches. The silver grey rocks seem to dissolve in the blue water. Then Limni appears, far off, a village of medium size, is leaning against the south and west side of the hill lying in half a circle. The winds here are typical local and give no indication how it's blowing 10 NM more to the north. Limni is a very nice village, animated, with a nice seafront and a small harbour where small fisher boats are coming and going. We found a berth at the quay, with a mooring on our stern. The numerous tavernas and restaurants are at 4 or 5 minutes walking so we have no particular noise trouble during the weekend. The atmosphere is relax and remember us that Greece of the eighties. The cleanliness of the village is a full contribution to the charm of it. People are friendly and our boat is subject of curiosity and interest. If we like the village - their village - , is a frequently asked question. A Greek-german couple renting small but mostly occupied apartments offers us a coffee, some harbour neighbours ask more information about our sailing boat and our project, another one, - doctor in Athens - gives us advices for a trip to the Sporades - preparing his new sails for the coming regatta. We are far, here, from the boor and disappointing attitude that we found so many times: we are wondering if people here have less problems, if life here is more easy ... or is it only the fact that we are more far-off from the so destroying mass-tourism. Yes, we are convinced that Limni could remain, for a large part, out of the influences which have so changed - disfigured - Greece ... That's why we will stay here some days longer. 01.06.09: Limni (N. Evvoia) > Loutra Aidipsos (N. Evvoia) 15,6NM, 09H35-13H00. For the coming days increasing southerly winds - up to 25 knots - are forecasted; so then the small harbour of Limni will be not so comfortable. We decide to leave for Loutra Ai(E)dipsos and later on for Orei. More northerly there should be less wind and the harbour of Orei should be more sheltered for south winds. At Wednesday rain and possibly thunderstorms are expected. It seems better to go on for not being kept here during a longer time. It takes us a little more than three hours to reach Loutra Aidipsos (/Aidipsou), a some more sophisticated place for Greek tourism so we must believe, well known for its thermal springs. The small harbour was recently partly developed but there is no much space: like in the most small harbours all space is taken by small, local fishing boats. We can just moore at the inside of the enlarged quay at the entrance. It's very busy here due the coming and going of small ferryboats to Arkitsa, one of the most important passages to Evia; at the mainland the motorway Athens-Thessaloniki is nearby. We are disappointed when we go to the Port Police for buying a magnetic card for water and electricity: the supply boxes on the quay are, like mostly in the Greek harbours, not working! But ... we have to pay 7,58 euro mooring taxes. No clear explanation why: in Limni the Port Police told us that we never have to pay for our less than 10m boat! On our arrival in Greece, the police at Corfu-Gouvia gave us the same information. Then we have to clean up a stinking bin at the quay that the very busy dustmen had forgotten. After the nice Limni every pretentiousness here seems us really out of place, for us this thermal resort has no real charm. 02.06.09: Loutra Aidipsos/Aidipsou (N. Evvoia) > Orei (N.Evia) 27,9NM, 07H20-13H00. A threatening sky makes our early start a little bit hesitating, but we don't want to stay any longer at Loutra Aidipsos. The meteorologists do not really agree and despite the Greek service expect some possibility of thunder in the morning, we decide to continue to Orei. Our conclusion is - after reading the gribfiles - that if thunder is coming this should be in the later afternoon or in the night; we also know that when the Greek Met-service is forecasting rain, they usually give also a thunder warning. The visibility becomes worse, the light grey cloudiness is increasing - a scarce sun is still shining - but it remains dry, apart from some big raindrops when we are approaching the Likhades islands. 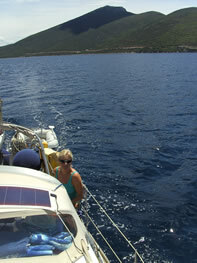 We have made the choice of the shortest way: so we'll sail between Evia and the low Monolia-island. In this narrow passage the current can be heavy at spring - up to 6 knots according our Greek pilot - but now we are just after neap, so we don't expect troubles. A nice fishing boat is passing us when we leave the narrow street, skipper and crew give an enthusiastic answer to our salutes. Then when the sun comes through the clouds, our trip to Orei - made longer by the current, we only go 4 knots on our GPS - becomes any way pleasant. We rapidly have to abandon our try to sail: the forecasted S-wind is ... NNW! 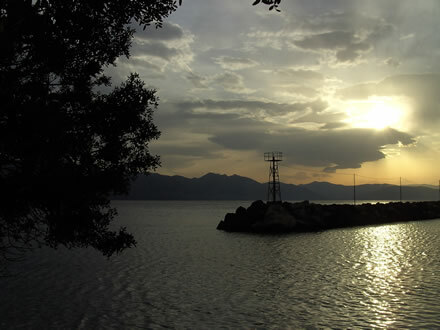 With the binoculars we explore this coast of Evia with its numerous bays: in most of them we see fish farms. Approaching the Orei channel the wind is increasing and we get the current with us. Orei is situated a little deeper into the bay, so we have time to prepare our arrival. We can moore at the renewed N-quay between Windswept and a British Sadler 34. Again we use our stern anchor because berthing bow to the quay is more easy, and gives a lot more privacy! It's the beginning of the Greek Whitsuntide and in a few days it will be full moon. On the six or seven bigger fishing boats the big cleaning up is going on: hundreds of meters of nets are checked and rinsed, small boats are going and coming to the two water taps at the N-quay where apart from a few fishing boats and a tripper boat, about six yachts are moored on the quay. So almost every space is taken. We want to stay here till the end of this busy weekend. This small fishing harbour is a pleasant place; there is a nice sandy beach with showers just behind the N-quay and we can get water at the taps used by the fishermen. When the sun is high we load 4Ah on our solar panels and Kaat is always looking for the best orientation. Just like in Loutra Aidipsos here also there are brand-new connections for electricity and water inoperative waiting for a hypothetic arrival of the needed software and magnetic cards. Already now we are wondering how long the system will work, when the first breakdown will occur that will lead the whole system to the in Greece unavoidable fatal destruction! Orei is well sheltered from the dominating northerly winds, only SW wind causes a short little uncomfortable swell putting anchor holding to the test, like we got during the second day of our stop by a SW 5 to 6. 09.06.09: Orei (N.Evia) > Hortó (Ormos Vathoudi, Chersonisos Magnisias) 20,1NM, 08H20-13H00. Departure from Orei at Evia at 08H30 for the last trip of our voyage: 18,7 NM according the chart. 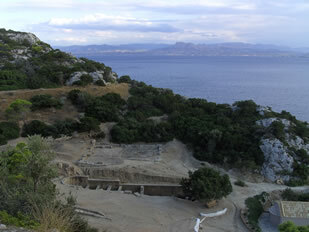 Hortó is situated in the Ormos Vathoudi at the south side of the larger Pagasitikos kolpos - the gulf of Volos. More southerly Trikeri mountains are lying. The whole Pilion peninsula is like a to the south curved finger from which the last part is returning to the north. In this region with its narrow straits and channels - between Evia and Trikeri peninsula, between Evia and the mainland - currents and winds are difficult to calculate or to forecast. Sometimes strong gusts are falling downhill especially when the meltemi is blowing in the Aegean. But today it's calm weather and we have rapidly the small fishing harbour of Agia Kiriaki at the south coast of Trikeri peninsula at our starboard. At the top of the hill we see the larger village of Trikeri where we were last March by car. It's rather busy in this narrow strait between Diavlos Volos and Diavlos Trikeri: a sailing boat is following the coast heading to Skiatos probably , two coasters, sailing close to the coast too - depths are here around 75m - are coming from Skiatos and are on the way to Volos, two bigger trip boats are also hurrying to the Sporades islands, while a big American warship - we see a whole fleet of helicopters well aligned on deck - is navigating in the straitt. Is this participating at the at the NAVTEX announced NATO-manoeuvre in the East-Mediterrian Sea? After we had avoid for a while all this busy traffic and then had passed cape Kavoulia, we steer for the narrow passage between the small island Palaio Trikeri and the peninsula. Here we were fifteen years ago for the last time with our Zodiac but the souvenirs are still very lively there: the small harbour of Palaio Trikeri, then - at the other side, at the peninsula, just before cape Trachilas - the bay of the " Witness of Jehovah " - we met the old man and his family when we were looking for a shelter by a suddenly strong increasing wind while sailing back to Hortó impossible -, then further on the very small Prasouda island - we know that a little behind us at SB the very nice, small Zasteni-cove is situated. Meanwhile we are under sail because the wind is there, even little strong as sudden. In a misty far-off we see than in front of us, Hortó, with the nice view on the Vathoudi-bay, and at the background the Magnisia peninsula and the hills of the Pilion mountain. On flat water, tacking by a gusty wind we are approaching our target. In March we already visited the little village, and the voyage from Lefkas to Hortó seemed to be a real challenge. Now the target is at a few nautical miles. A hot wind increases a bit when we are approaching. Hortó... the small concrete jetty where we will moore: everything goes fast now. Dropping the sails, starting the engine, preparing the mooring lines at the central bow cleat and the stern anchor keeping ready. There we go, we drop the anchor, pass two small mooring buoys and a small boat, two meters .. one ..
Eric jumps to the jetty and ties up the ropes. Arrived! 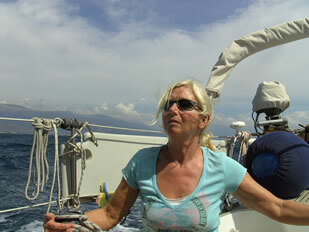 We reached our target and are able to update our website : " Tacking by 22 knots app. wind, we arrived at 10H00 UTC / 13H00 LT at our destination. Nehalinnia is moored on her stern anchor at the little quay of HORTÓ! " 21.06.09: Hortó (Ormos Vathoudi, Chersonisos Magnisias). Since our arrival almost two weeks ago we are living a dolce farniente. Although the weather situation is not really steady we got no real bad weather. Nor yesterday,when a thunderstorm seemed to come but we got only dark clouds, a short shower and some thunder. One hour later the sun was shining and the thunderstorm was gone to Volos, a typical but rather scarce evolution, people know here. But not so usual is the relative instability, with its changing, capricious winds and the frequent cloudiness in the afternoon. In the evening the wind normally is falling, but during the day the W-ly or E-ly winds - not really the prevailing winds - are blowing up to 24 knots - according our lazy anemometer - at the well sheltered bay of Vathoudi. That's all a little bit, unusual, so we hear. 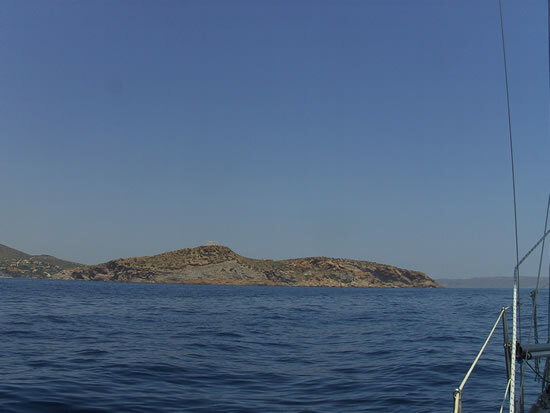 Depending of the relative certainty about the weather we anchor on our stern anchor at the end of the jetty at Hortó or we go to the anchorage in the SE corner of Ormos Vathoudi. 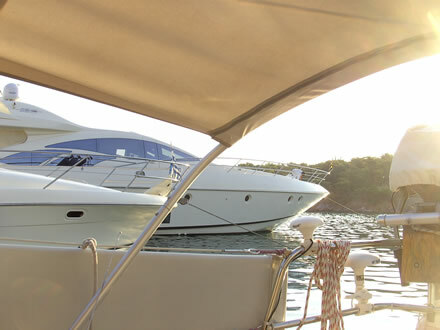 When the boats have left after the crew changes, we can also enjoy the hospitality of the Sunsail-pontoon, with . water and electricity (5,- euro/day), and showers! Here we have a very good welcome. The difference with our bad experience in the Saronic gulf is immense. No invasive arrogance here, but a nice sailors mentality and atmosphere by the British management and staff. We also noted the discretion of the flotilla stop in Orei. consequence of the bad cooperation and defects of the local authorities. But at Milina we are lucky to find a few internet cafés with rather fast wifi-connection. By our visit of Volos, the poor condition of the (new) marina in the harbour, seems to be an example of incompetence - the story tells that the pontoons were already five times rebuilt! Otherwise Volos is a nice town ... to do some shopping - no lack at all of supermarkets and specialised shops - or to spend an afternoon or evening at one of the numerous terraces at the large promenade. 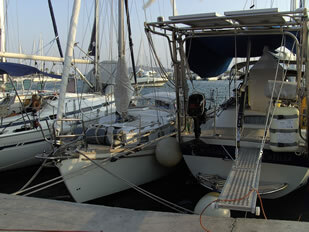 Due to changes in the Sunsail-offer in Greece the base of Milina-Valthoudi has been closed. The pontoons incl. water- and powesupplies and showers have been removed. At the present time limited water and power supplies only in this small harbour. Places were very quiet when we were here in the early nineties for long holidays: above all, Greek tourism was more limited. All this new, big and expensive cars, many times bought on credit - very long easy terms of 72 months - were not seen. The British and above all German people who have bought houses here, were quite not so numerous. We saw here only a few foreign sailing boats and a Greek owner of a 32' or 40' could hardly be found. Now we hear in Milina that this year there are less tourists, that people haven't money anymore, and that people are afraid for the future, that this is a big problem ... But when we see at Saturday night the full crowded restaurants we are wondering whether those complaints are not exaggerate.... An other story that we hear is that people here don't really need tourists, that they prefer to have no foreign visitors, that six weeks Greek heavy spending tourism is enough ... checking this seems to be difficult, but what we feel, is that people here are not really friendly with foreigners, and, for those who wanted to stay here things were not easy... If one fact can be an example for generalisation than this story will be relevant: the mayor of Milina wanted to remove the mooring lines of two foreign sailing boats, berthed together alongside in the harbour- like always heavy subsidized by the E.U. ; for him yachts were not welcome and he should allow only fishing boats. Should this be an isolated event or have the inhabitants of this country in difficult financial situation decided to shoot in their own feet, now that it seems that also the parallel economy is partly drying out? 17.07.09: Hortó, Milina, & Ormos Vathoudi, Chersonisos Magnisias. Since a week the weather seems more steady. The daily threat for thunderstorms eased. Although ... last night, under a magnificent star sky, a lonely cumulo nimbus, produced some lightning and a few thunders. Finding no response, he slipped away rapidly. The HNMS forecasted a possible thunderstorm ... but for the NW of the mainland! We are now since one month at Hortó, the destination of our voyage, and a certain not unpleasant routine is managing our " oversummering ". While some expectations are being realized, we feel how others now will remain as illusions. Normally we are now halfway of our project and and the way back will be as long - or longer. So a small balance is necessary. A first attempt. 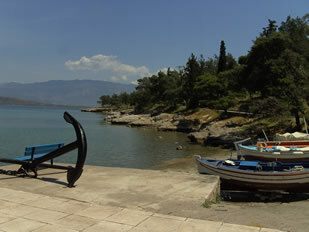 holidays of 1992, 1993 and 1994, when we dreamed of sailing with a small boat in this beautiful Pagasitikos Kolpos. Although we have done then numerous explorations with our Zodiac, we had never experienced the anchoring conditions at night - we did now!. We must conclude that we could not anchor many nights here. The last time, a few nights ago, we awoke by the swell from the west, making sleeping really difficult. At the present we still have not heard any convincing explanation for this end-of-night swell in the absolute absence of wind, nor from the locals nor from sailors. For our part we advanced the hypothesis of a land breeze, because then the "cooler" continent is located at the westside of the Gulf - at the eastern side, from the north to the south,the rather narrow peninsula is extending from the mountains of the Pilion to Trikeri. Perhaps a naive reasoning, valid or not, however, the swell has forced us to join at the end of the night the anchorage of Vathoudi - or at other times, to take advantage of the hospitality of the Sunsail base. We forget our plans to visit the North Sporades: the stories of other sailors confirm our fears and we really want to avoid to find ourselves in hell of mass tourism! And then there are the limitations that our small boat imposes: absolute carefulness for the weather conditions and humility in relation to our autonomy for water, fuel and current; so a longer stay at an isolated anchorage is not so easy while the few harbours offering a relative protection from the prevailing winds are, now at the high season, intensively visited by many flotillas. For us - and this choice is clear - the conclusion is to abstain! Vathoudi is as a good anchorage - moreover very quiet so far - also the opportunity of pleasant encounters, often both exciting. On the magnificent and unique yacht of M. and O., more than 15 m long, we enjoy many hours listening their beautiful and captivating stories " from the other side of the ocean ". At other times we met there French and German sailors for a drink with urchins fresh fished by O. At an other meeting, around an other apéritif on our small boat, with A.-A., the skipper of Belgian sailing boat, we get the confirmation that the sailing world is really small. By the most ultimate lucky coincidence A.-A. will allow us to get back in touch from this anchorage in Greece, through interposed portable, with a mutual friend in Wallonia. The earth is really round, says this story too, when the circle of the fate is closing during a moment around three lives. But now we expect Olivier's arrival at the end of July ... and we are curious about his reactions after 15 years! 31.07- 09.08.09: Hortó, Milina, & Ormos Vathoudi, Chersonisos Magnisias. Despite this small hotel is involved, together with the owners, in a slow but fatal progress into ageing, a real charm is still preserved. A nice, brand new lift - strange in this timeworn scenery - and a few recent air conditioning equipments, cannot conceal that time stopped here. 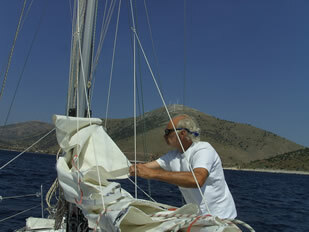 soon going to backstay wind: we want to reach Ormos Vathoudi under sail. And we succeed every time, even in the narrow passage of south Alatas. An other day it's by car - we have rented a small 107 - that we visit "the other side" of the peninsula, that we go to the beach at Platania, or at Kastri, at Katigiorgis; we anchor at Zasteni, sail to Kotes, and eat oktopodia at the terrace of a (too) busy taverna at Agia Kiriaki, during the only one shower by day of Olivier's stay. At night we vary the restaurants, Favios at the small locality Mavra Petra, Martha's at Hortó, by two times we find the coolness of the night dining at Lafkos, on the hills. 12.08.09: Hortó, Milina, & Ormos Vathoudi, Chersonisos Magnisias. The Greeks are now on holiday and during the weekend of the 15th of August all places with beaches will be absolutely crowded. Since about more than a week Milina too gets very important seeing by holiday-makers. Nevertheless il seems that a real return of touristic business has started after the uninterrupted years of growth since 1993 - the last years many Greeks were getting richer while sleeping, this was the bitter judgment of a wise man at Lefkas. On more houses than in the past little signs indicate that rooms are still not occupied - sometimes since a few months, so we hear - and it happens that people offer us to rent a small apartment or a domatia. In Athens News we read data confirming this down trend, while, here or there, during a conversation, concerns appear. It's a hard reality when people living from the touristic manna were thinking that the nice cloud they were living on was endless! Even the weather seems to share into a certain pessimism: in the sometimes not so heavy blue sky small clouds at times are daring and warnings for thunderstorms are almost daily. Luckily, apart from a rare, heavy shower, a few lightning or some rumbling, we are spared from real bad weather. 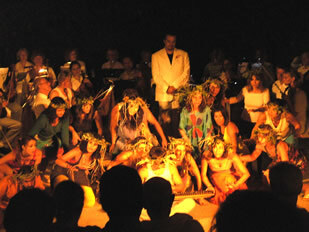 The Summer Meeting in Horto Mt Pelion 2009, organised every year since 1984 by the non-profit Cultural Foundation "G.Angelinis - Pia Hadjinikos", www.horto.net, info@horto.net, presents from mid-July till early September a rich variety of cultural events: music, theater, dance, exhibitions, seminars. 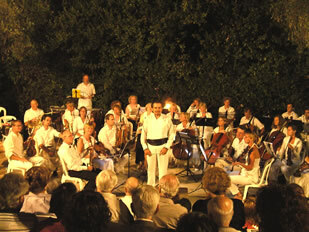 We have participated at three concerts in the Open Air Ttheater of Horto. THe Utrecht Symphony Orchestra directed by Jorgos Moutsiaras has executed a.o. Ouvertures from Beethoven (Coriolan, op.62) and Rossini (Italiana in Algeri), the Symphony in D and 3 movements from Joseph Boulogne de St Georges, and a remarkable première for Greece, the 'Ouverture "Wuthering Heights" for iPhone and orchestra from Wim Van Noort. But it's particularly the guest soloist who left a great impression between the audience: clarinetist Michel Marang has really bewiched the audience of this theater where many seats had to be added. His arrangements of the Klezmer Musiek (traditional secular Jewish music) got him a great and enthusiastic ovation. Celebrating the Foundation's 25 continuous years of summer events at Hortó and the birth bicentenary of Felix Mendelssohn, the Theatrical Workshop, directed by Jorgos Biniaris (theater), Smaro Grigoriadou (music) and Marianthi Psomataki (dance), with the Utrecht Symphony Orchestra directed by Jorgos Moutsiaras presented A Midsummer Night's Dream (op. 21 & 61) from William Shakespeare, music from Felix Mendelssohn. It was a fascinating and dynamic show rich of scenery effects brought by the dancers-actors and the ballet at which participate young people from different countries. In this particular Open Air Theatre the beautiful voice of soprano Rania Stamatiou left a charming impression! 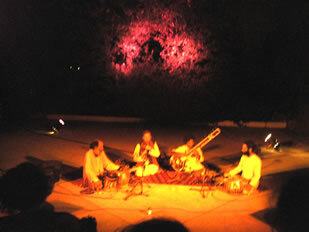 And then, two days before our departure from Hortó we had the opportunity to participate to a concert of Indian classical music with a.o. Erik Alsen, sheinai, and Inbal Zadok, sitar. This concert had been postponed due possible thunderstorms. The Cultural Foundation "G.Angelinis - Pia Hadjinikos" is part of Hortó, this small, nice and particular village. 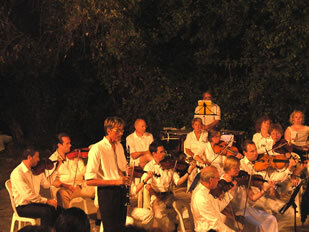 Greeks from everywhere and foreigners participate at the summer events. From different sources we heard that the support of the municipality of Argalasti, is very poor - it's an euphemism: culture, style and quality are they also here in this far but nice Pilion, creating jealousy and envy? Yes, he's probably right, who, living here since many years, told us, with some discourage: most people here are to stupid, to narrow-minded, trying to change them is hopeless ... and it seemed that then he was not only thinking about Hortó! 27.08.09: Hortó (Ormos Vathoudi, Chersonisos Magnisias) > Orei (N.EVIA) 21,5 NM, 07H15-11H45. Motoring with the mainsail hoisted, we sail to Orei: nice weather, little northerly wind. 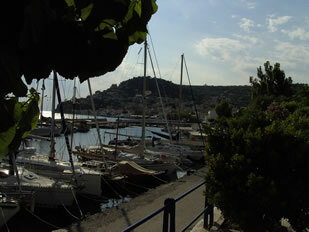 In the small harbour of Orei we find a berth next to a Greek sailing boat. In the evening there is no more berth available in the small harbour - for a large part the consequence of the total lack of organization. Some cafés around the harbour will cause a lot of noise until the late in the night . 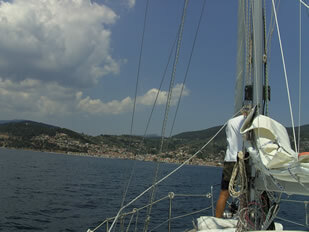 28.08.09: Orei (N.EVIA) > Limni (N.EVIA) 38,1 NM, 07H15-14H15. 07H15. We are on the way to Limni. The weather is nice but like yesterday the northerly wind is to weak for sailing without motoring, although we hoisted the main and have unfurl our foresail. About 5NM before Limni suddenly the wind increases and in a few minutes we get E 25 kn on the wind meter. The wind now is falling from the mountains and still increasing; this will not simplify our approach nor the access to the narrow entrance. There is some space just behind the entry along the recently extended jetty. After a successful 180° manoeuvre in the narrow channel, Kaat stops the boat along the concrete wall. We must keep the boat at a distance because the concrete is already breaking up: it's real threat to the hull, especially as our fenders can offer little protection due to the big cavities in the wall of the jetty. 29.08.09: Limni (N.EVIA) > Chalkis (N-side bridge) (N.EVIA) 22,8 NM, 07H15-11H40. We want to continue our progress toward Chalkis now that the weather forecast announced a few days of mild weather for South Evvoikos. It's what we need to reach at least Olympic Marina, 1NM south of Lavrion. Last week it was very windy here, force 7 to 8. Shortly before noon we go alongside the Ovni 455 Swiss we met in Limni. On the Promenade of the north harbour - a quay of hundred meters long - there are many trendy cafes. At this nice Saturday terraces are crowded all day. Fortunately the big sailing boat protects our little boat from the prying eyes of the walking people. We also meet - the merest chance - our old neighbours of Limni. On our passage in May they had shown a great interest in our boat. Both families are returning, with their two boats, after a disappointing and even somewhat traumatic holiday: still highly impressed by the events, they got up to 65 knots of wind when a storm suddenly rose in Kaffirasstreet - between the islands of Evia and Andros. The engine of one of the two boats crashed due to the development of bacteria in fuel. At the office of the port police where we pay the bridge passage fees, we hear that no prediction is possible about the time of passage. During the three days preceding the neap tide (we are currently in the first quarter moon) patterns of high and low water are irregular, as noted in the pilot table. By the comings and goings of many high speed ribs, the wait is not really comfortable and the boat pulls sometimes violently on its moorings. Kaat finds a water tap on the quay under an iron cover in the quay pavement. We stock up our cans with fuel at the service station located at the end of the parallel street, not far from the great square in front of the bridge. From 9 p.m. we are stand-by at VHF chan. 11. We haven't forgotten the experience of two of our compatriots who were asked to be, as usual, stand-by from 10 p.m. . They were in a restaurant when the bridge was turning earlier, just after 9 p.m.! They had to wait till the next opening ... 24 hours later! In fact, the moment when the current stops ( it's the of moment of the only passage, at night) is never predictable with full accuracy. The bridge will only turn when the instruments measuring the current will indicate slack water. Finally, this time too, we will not have to wait for a long time: at 11pm we pass Chalkis bridge, a good time, when we heard people passing at 3 at night! 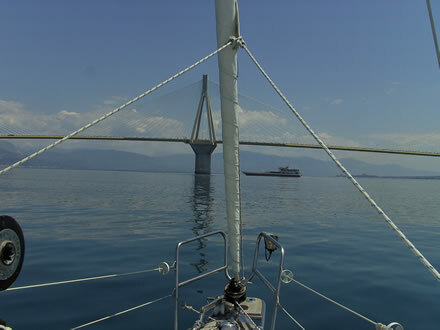 30.08.09: Chalkis (S-side bridge, S-harbour) (N.EVIA) > Voufalo (N.EVIA) 28 NM, 07H15-12H45. Voufalo. At noon, after a fairly relaxed passage of 28 NM, we anchor in 5,5m water, just behind the sand spit at the entrance of the bay, where starboard light is located. There are three small wooden jetties, but they are crowded, just like the quay, however, there is little water - 1 to 1.5 m. Despite we hoped to moore there - on stern anchor - to the farthest small pier, where there is more water. No, thus. Our dinghy is deflated on the foredeck, because we don't want to tow it over long distances and for keeping it inflated we have no space neither on the fore deck nor under the boom. So we'll stay on the boat. It's very nice weather and blue water is a real invitation. In the late afternoon the wind is little increasing and small gusts are creating wavelets. In the later afternoon one after another all-motor boats, and most visitors of the few some restaurants, leave the village. But then again the macho behaviour of many rib owners creates an unpleasant swell and waves. That this creates discomfort for the occupants of the two boats at anchor - they pass very close - seems to escape these gentlemen, sadly forced - no doubt about this - to prove by this way their virility to their female court ... When Kaat drew the attention of a semi-rigid equipped with 2x 250 hp. about the speed he is going, this surely great seaman finally reduces its speed and disappears apparently embarrassed ... But 50m further, in a lot of noise and a sea of foam, he's pushing in his toy all the available horses ... When quietness is back, the sun begins its slow descent, and we enjoy the calm regained in this pleasant anchorage. A little Greek music - Greek, finally! - comes to us. Tomorrow there are more than 35 miles ahead in this windy area between Evia and the mainland. A final weatherforecast, thanks to our internet connection, reassures us. 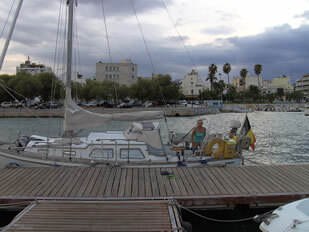 31.08.09: Voufalo (N.EVIA) > Olympic Marina, near Lavrion (mainland, ATTIKA) 37,6 NM, 06H15-13H30. So we start sailing early this morning and we hope to arrive at Olympic Marina in the early afternoon. We are sailing with one reef iin our mainsail and boom guy, because on our small boat the boom isn't very stable. Behind the first coastline and hills, we see the results of the heavy fires of the last weeks around Marathonas and other villages of the green lung of Athens ... the sailing along this coast of Attika is not particularly beautiful more monotonous apart from the view to the islands ( S-Evia, Andros, Makrinitsa ) far off at our port. Yesterday we have made by phone a reservation for a berth: Tuesday the weather should be more turbulent, windy, with a possible thunder too, and we have also some domestic work to do ... so we'll appreciate this marina stop ... despite the rather expensive rate! We get a nice welcome at the marina, and start immediately our works! For dinner we go to Lavrion at about 4km by road, because at the marina restaurant - at 9 p.m.! -. they can serve only toasts! We find a nice small restaurant near the fish market. When we look for a taxi at about 11p.m. we learn that in this small village (!) like the owner of the kiosk nearby says, there are no taxi's more at this late hour! In Greece when you have a problem, there is still somebody to help you - that hasn't changed! - and when the man - he has been living for a time in Charleroi (B) - has closed his kiosk he offers to drive us to the marina, in his full-options car! 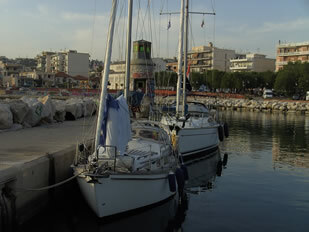 01- 02.09.09: Olympic Marina, near Lavrion (mainland, ATTIKA). Very windy today on the 1st of September: in the harbour we get 25 kn on the lazy wind meter. By taxi we go to Lavrion to see the harbour by day and to do some shopping and get some provisions. In the afternoon the boot gets maintenance. In the evening back to Lavrion, making a taxi reservation for return! On the 2nd, still windy in the morning and a wobbling sea, not the most comfortable to pass Cape Sounion and cross the Saronic gulf to Aegina island. So we stay in the marina. In the afternoon a sailing boat under German flag arrives at the catway next to us. They come from Lavrion - a really unpleasant and noisy harbour they say - but the day before they sailed from Kithnos. A real fight against wind and waves: at times their speed was falling to 1 kn. They will leave the boat here, where their son will come on board and will sail the boat to Croatia. They will fly home on Saturday, after this four weeks holiday: heavy winds, salt, tiredness, stress ... Hearing their story, we are thinking that if you have time, it's better to avoid such experiences! 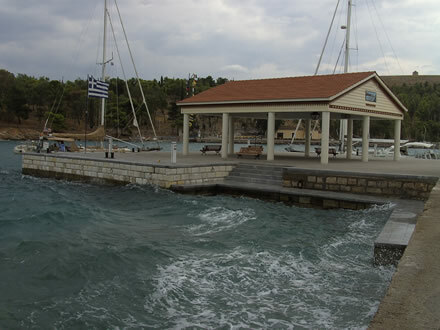 03.09.09: Olympic Marina, near Lavrion (mainland, ATTIKA) > N. Aegina, 37 NM, 07H10-14H30. Today we start early to cross a large part of the Saronic gulf. 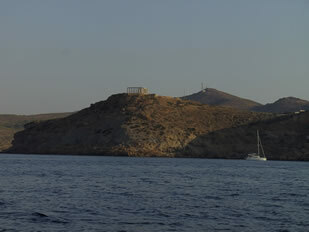 Soon appears in the nice grey-blue and orange light of the morning, the temple of Poseidon above Akra Sounion. Thanks to a weak wind we can keep our main full: so Nehalinnia gets enough stability to sail comfortable also when, far off too, a small fishing boat, or a big ship, creates an unpleasant swell. At 10 a.m. we are at 17 NM from our waypoint, at the SE point of Aegina island. The display of our pilot shows a course to the west of 279°. We are little worrying about our sounder: that it cannot indicate water depth here is normal. Depths in le Sardonic gulf are till about 215m while our sounder shows only 7m - but the units display seems being flashing too, meaning a possible trouble. Bad omen, as Eric sees it. The Owner's handbook seems to confirm our fears. A workship - on deck an big crane -, a coming straight just behind us: is he passing us, have they seen us by this dazzling sunshine, are they keeping a permanent and appropriate outlook? And what about our sounder ... Perhaps we'll have to replace it at Aegina, there are a few ship chandlers ... or at Lefkas, but Lefkas is still far away, we have to sail the whole gulf of Corinth, and the gulf of Patras, then sailing up to Lefkas ... and for sailing to Mesolongi it's better to have a reliable sounder ... succession of thoughts ... our looks express our anxiety ... Meanwhile the ship has altering its course, it's sailing to Piraeos ... Eric starts his troubleshooting, kneeling down, his head making an angle of 90°, manhandling his cervical vertebra, there, under the table, under the floor, at the back, behind the drawer ... he's checking the transducer in its oil bath, then the cabling; with a contact spray he's cleaning plugs and connections. But no result. At 11.15 a.m. we leave Piraeos VTS behind us. This time we had not to reroute: a few big ships were to far or behind us, and two have altering their course to give way! Still no or less wind - (ap) 036° over starboard, 6kts. Far off, in the west, above Corinth, big clouds announcing thunderstorms are setting up, high cumulonimbus towers, anvils of merciless ... 1 p.m.: Akra Pyrgos is at 1NM. Kaat takes the helm and steers a more N-ly course: is she bringing Nehalinnia toward the rocks? Then, very slowly, appears between the two islands, between Aegina and the very small Nisos Moni, a narrow passage. 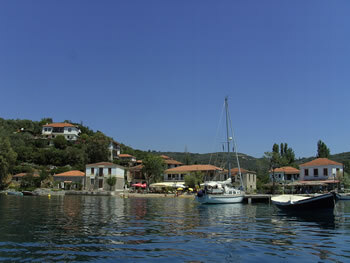 the small harbour of Perdika is now on starboard. When Kaat is steering a NW course, to the harbour of Aegina town, the wind is coming behind us, 5kts, tells our wind meter. At 2.30 p.m. our small boat is moored at the town quay, on stern anchor, squeezed between two sailing boats of more than 40 feet. In this infernal harbour the Dutch owner of the Yucatan, a Hallberg Rassy 45, is watching over her magnificent boat with an extreme application. On her blog - www.yucatan.nu - she tells the voyage. Improving her style she tells on Marcella's andere verhalen also amazing stories. When the night is falling, the harbour is crowded. For Marcella the coming hours will be less stressful. The swell that the hydroplanes cause, almost permanently, by day in the basin, now that they have stopped their coming and going for the night. But sailing boats and a yacht are still arriving: in the night they are looking for an ... unavailable bert! We'll try to find some quietness and peace at Tsias Ouzeri. Aegina, no, really thanks, better not! And, by the way, the sounder? Eh, well... it's working ... well! 04.09.09: N. Aeginaina > Korinthos (Peloponnisos) 27,3 NM, 07H00-13H20. We had a disturbed night. Till very late it was very noisy and at the end of the night we were awaked by terrifying sounds of screeching brakes of delivery vans. The weather forecasts we get from internet report a light wind from W to NW, 2 to 7 kn Poseidon tells us via text message that at 2 p.m. the wind will be SE 2Bft. But at 8.30 a.m. the anemometer is indicating an apparent wind from NW of 20 kn The result will be a battle against the choppy waves as the sea here rises rapidly. If we want to make some progress to pass the Corinth Canal today, then we need to keep the small Diaspora islands north of us, the road that we followed in May, passing south of N. Ypsili and north of the Diaspora, now on a heading 305°3, means, for 25 NM, going against the waves. At 10.45 a.m. we are at 1.5 NM east of N. Evraios. The waves are a little shorter, we measure NNW 24nds (ap). We have still 9MN to the entrance of the canal. The wind remains strong but in the approach the sea is more calm. 12.00 we moore at the large quay where are located the office and the control tower. We need all our fenders and our two 45cm balls for protecting the boat. The paperwork is highly simplified: our coordinates are still in the database since our passage from west to east, and we can pay the passage tax by our credit card. Sign of the times: at one of the bridges there is an installation for the bungee jumps; when we pass a few daring are jumping in the water between the boats, to the applause of their admiring spectators .... impressive, but the canal authorities are present ... by VHF, as we hear. 01.05 p.m. When we pass at the W-exit of the canal the hydrolic bridge - which goes down into the waters - a strong wind welcomes us. This is not a surprise as we have read it in the pilot. The harbour of Korinth is at 1NM south. 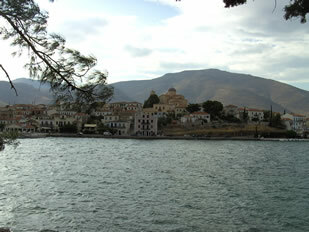 Tomorrow we want to continue to Galaxidi. 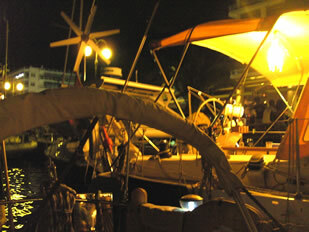 So it is easier to go alongside a Greek sailing boat our bow already turned towards the exit of the harbour. The concrete quay do not really inspire confidence nor the use of our anchor in the middle of so numerous buoys, chains and mooring lines on the bottom of this small port ... This evening we have supper on board: we don't want to leave the boat alone. We don't like the atmosphere in this harbour. Fortunately, the restaurant Mediteran [sic] is very neat and offers a fine selection of excellent takeaway ..
05.09.09: Korinthos (Peloponnisos) > Korinthos (Peloponnisos) 27,2 NM, 06H50-12H30 (!!!). This is the short story of a return to square one! 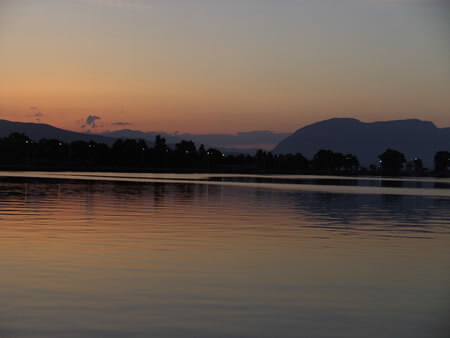 At 06.50 a.m. we leave the port of Corinth. A reef in the mainsail and 38 NM ahead. At 09.30 a.m.when we still have more than twenty miles to go, cape Melagavi and the bay of Corinth are already a few miles behind us. The weather is sunny but the wind meter indicates 21 kn NW [ap.] and the waves are perpendicular to our course ... towards the NW. The differences in depth are big: we now have approximately 830m below the keel and two miles behind us, the depth is "only" 200m! Although there is not much wind, waves of about 1.50 m are short: they regularly seriously reduce the speed of the boat, which then falls to 2.5 knots. When Olympia radio forecasts NW 4 for the whole day, our decision is taken quickly. In two hours we return to Corinth: with a reef in the mainsail, boom guy, and high aspect foresail, we have an average speed of 6 kn, the waves waves cheerfully passing under the boat. We moore along the south quay. In the afternoon Christos and Joana with their Espace, Ioana, return from their holiday in the little Cyclades. One of the next days they will invite us for an amazing trip by car. Still disturbed weather - rain and thunderstorms. A W to NW wind, force 5-6, and waves in the Gulf of Corinth from 1.5 to 2m require us to wait in this not really comfortable harbour. Christos and Johana give us the advice to moore the boat at the head of the first pontoon, better protected against the swell. 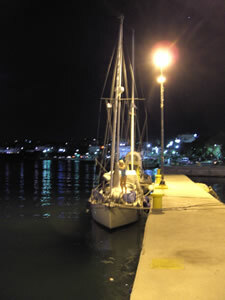 The Greek sailing boat found a berth alongside the north quay. 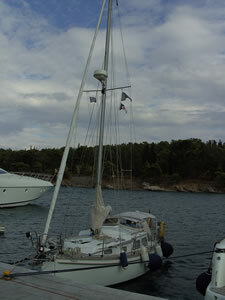 The Belgian sailing boat Gaviota of Paul and Christine, is also moored at the north quay, alongside a 38 feet under the Greek flag. They arrived the day before yesterday. They too were surprised by the height of waves in the gulf; during the storm they were anchored ... But the Gaviota is much bigger than our boat and its crew, much better and more experienced sailors than we are! They will also remain a few days here until the weather improves. They are en route to Turkey and want to recognize the Saronic Gulf before closing the season at Aegina. But Christos wants to show us three remarkable sites in the vicinity: the well known resort of Loutraki, the Vouliagmeni Lake, and the lighthouse and the Heraion of Perachora. Our trip goes first to Lake Vouliagmeni: we cross Loutraki to take the road to the west of the Peninsula of Agrilios. The particularity of this inland sea is that there is only one narrow passage to the sea - only a few meters wide, just deep enough for the passage of a small boat equipped with a powerful engine because the currents are strong. We go around the lake which has some beautiful beaches, but it is very windy and these usually calm waters, are rough. Certainly not a nice day for swimming! Now the tavernas are empty but on weekends it can be crowded here. There is also a camping but it does not seem very welcoming. By the path that leads to the lighthouse we reach almost to the tip of Cape Melagavi that we had left on our starboard, a few days ago when we tried to reach Galaxidi, before returning to Corinth. From here we have a beautiful view: in front of us in the west, the Gulf of Corinth, on our left, looking to the south, the coast of the Peloponnese; behind us, looking to the east, the Bay of Corinth and the town; on the north of the city, the entrance of the channel and the seaside resort of Loutraki, dominated by the imposing Geranei mountains . On our right, so north of us, the Gulf of Alkyonidon. It's therefore not surprising that the weather elements are sometimes very angry here. Add, then, the water temperature. So when the thunderbolts of Zeus and Poseidon's trident decide to complicate the navigation of the humble sailors, they can only hope to find protection ... in the harbour! 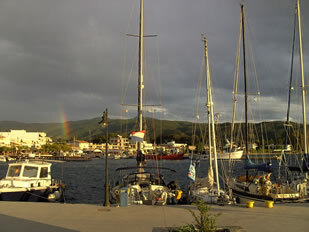 10.09.09: Korinthos (Peloponnisos) > Galaxidi 35,8 NM, 06H50-14H00. But the most capricious weather, too, needs some respite. So if we can believe the forecast, tomorrow should be a nice day. we have said goodbye to Christos and Johana. Yesterday he showed us its last acquisition: a beautiful electronic accordion. Just like last year - at Eric's birthday - we had the opportunity to enjoy some delightful musical moments, a result of his talent and his warm and deep voice. We promised to meet each other again after the darkest winter months . The wind is N to NE, we sail on the mainsail and jib. We have 1kt current with us. But many times we have to start the engine because there is not enough wind - 6 to 8 kn [ap] - to make good progress. We really are trying to reach Galaxidi because for tonight and tomorrow the forecast is again very pessimistic - windy and stormy! At 06.45 a.m. we left Corinth. 10.00 a.m. : are following a NW course 315° and we are at 15 NM of our waypoint south of Krissaios kolpos, the gulf where Galaxidi and Itea are. So it is not there we go! ? The bauxite mines near Itea cause freight traffic and ... red dust as we saw by our passage in March when we went by car to the Pilion. Itea seems also monotonous and uninteresting. 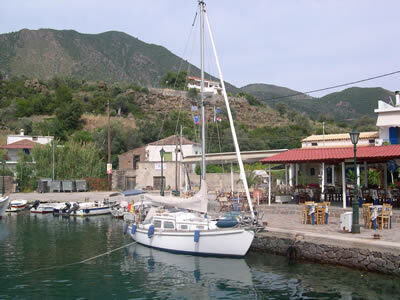 On the contrary, Galaxidi is picturesque and has now a good renewed well equipped quay. During our passage in May we stayed one day more and we had a nice stop there. 11.40 a.m. Now we are following a more northerly course to the approach waypoint to Galaxidi, between the islets Agios Georgios and Apsifia. We know that this is the obligatory passage to reach the harbour after keeping at port and sailing around the rock on which, in a large grey-white rectangle, we see the drawn silhouette of a dolphin. At 2 p.m. we moor our boat at the quay. End of a trip without problems. After days of doubt in Corinth, we reach finally Galaxidi! End of a Greek summer: after the the thunderstorm in Corinth we wonder what we can still expect from this as so nice vaunted month of September ... Strong winds from the north and the east daily bring their share of dark clouds, and if it's not a thunderstorm then it are showers that are ruining every summer feeling. We do not want to complain too much but this is not the weather we went for in Greece. After the abnormally rainy winter at Lefkas, here again we will be unlucky. Climate change. Warming up. That's what we hear. Or, simply, as others see it," a less nice year ". Nehalinnia is moored just next to the wide steps. We have had three successive neighbours: first a German couple on their way to Turkey. Despite the bad weather they sailed away: they had to meet their daughters in Epidavros. Then it was a big Greek yacht, later a chartered sailing boat. The crew - two couples on holiday, also Germans - have taken all their time to visit the region by car. We'll meet them again in Mesolongi. Although Galaxidi has lost much of its prestige - in the XIXth century it was the second nautical centre after Syros (so we read in the Guide du Routard) - some atmosphere of importance remains. There are still beautiful houses - those of the ancient ship owners - and even when some damages are visible, some decorative components testify to the former and relative wealth. 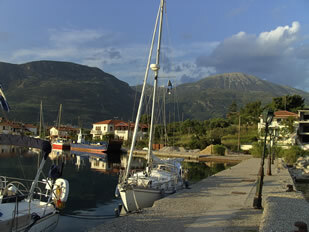 Currently Galaxidi is a destination sought by foreign and Greek tourists. In addition, Delphi isn't far away, and many sailors too are visiting from here the sanctuary of Apollo. Four times we have already visited this beautiful and impressive site at different hours and by different lights - it was even one time the place of a truly memorable and little surrealistic meeting. A fifth visit is therefore not part of our instant intentions! By (strong) winds from N and NE the harbour is fairly uncomfortable. The platform with the kiosk offers some protection against the swell. But nevertheless the waves work their way into the harbour. But where we are moored it's not to bad. The pilot reported that berthing east and south of the kiosk can not only be very uncomfortable, but even dangerous. Three days ago we had for neighbour a big yacht under Greek flag, 46 feet, too big for here, we thought. A little later, a bigger one appeared ... 86 feet! Sunday, in the late morning, the two yachts disappeared: the end of the weekend! Today, around noon, a beautiful large "dinghy" is entering the harbour. Accompanied by a crew member, the owner of a super-yacht - under the Maltese flag - which yesterday was anchored in the bay, and his wife, climbed onto the quay. He wants to berth here. Anastasis is a familiar figure here: he is a poor fellow, a little restless, who, gesticulating and loud crying, helps the arriving boats mooring, in return for a few coins ... He speaks English rather well and many sailors use his services ... but forget the little bonus! Very soon a irrational conversation arises between the multimillionaire and the self-proclaimed harbormaster. This yacht is too big to berth at the quay here, Anastasis seems to say while he's gesticulating wildly. But the couple doesn't want to hear this and their crewman-servant starts to evaluate the manoeuvres, constrained to obey. Grivas too, the water-electricity-and-fluelman - as mentioned on his new card, which suddenly appeared, out of nowhere and earlier than usual, isn't able to convince the yachtsman. But then suddenly he changes his mind, yes, of course it's possible, no problem ... such a yacht is very welcome indeed, of course, water and fuel ... but of course, immediately ... when you want ... Half an hour later, Monsieur and Madame are congratulating each other, smiling on the quay of the small harbour of Galaxidi, overflowing of admiration for their yacht and conquered berth, and taking many pictures. 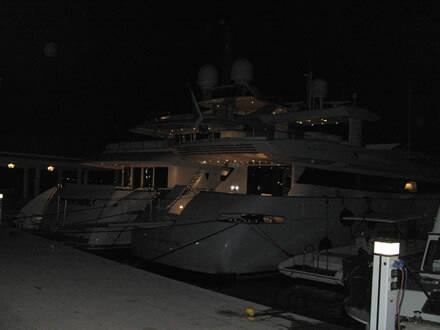 The 110 feet yacht is on two anchors and its moorings tied to the small stainless steel rings, fastened into the cement. Just like some meters further, at the other side of the wide stone steps, a 27 feet sailboat: Nehalinnia! the crew, three men and two women, starts the cleaning works immediately, because this yacht has to be perfect! 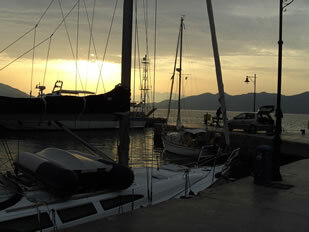 16.09.09: Galaxidi > Messolonghi 50 NM, 06H45-16H30. Messolonghi - or Mesolongi, there are several transcripts - is at 58 NM from here. There are some harbours where we might make a stop in case of problems or if suddenly the weather should becoming bad - N. Trizonia at 21 MN, Nafpaktos at 11NM further to the west (if really needed), and Patras too at 39 NM (where there is a small marina). But we want to reach Messolonghi, then there will be only one or two stops to Lefkas Marina - two, with a stopover at Astakos or Vathy, on the island of Ithaka; Sivota, at the SE point of Lefkas, is still an other possibility). We really want to make progress as the poor and variable weather will maintain - so it's a little risky prognosis and we must maximize each day. In Lefkada we have some more are less urgent appointments (laboratory, dentist) and our supply of glutenfree breads is slowly decreasing. We also want to meet Wil and Jeanine before they leave for the Netherlands. The weather forecast for today for Korinthos kolpos does not seem too bad, however - NE 2 to 3 - but during the afternoon the wind will turn to the west at the W-side of the Gulf of Patras. At 09.30 p.m. - we are now three hours on the way - Cape Psaromyta is at starboard. If we would to go to N. Trizonia, we should take a NW course but we continue the west - heading 280° - toward the big new bridge over the Strait of Rio-Antirrio, the passage from the Korinthos kolpos to the Patraikos kolpos. At 12 o'clock we are at 4MN from the bridge and the current is still running with us. The wind - which is now really astern - has little increased, 7-8 kn [ap.]. As a precaution we took a reef in the mainsail and put a boom guy; the high aspect jib is furled. We cannot keep the foresail full because of the rolling due to the astern coming waves. At 12.20, at 2 NM from the bridge, we call Rion-traffic on VHF chan.14 for the first time. Approaching the bridge where the strait makes a real funnel the wind is still increasing: 15 kn, 160° over starboard (ap). 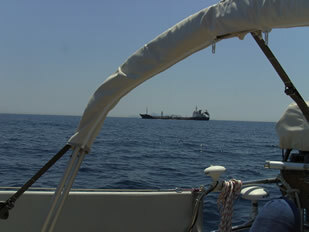 On starboard side we see a small tanker leaving the anchorage of A. Antirrio. A big white bow wave ... phew, it will pass behind us, then it starts to overtake us at port side. The waves are still higher - 1,50 m - and in a white foam they are rolling under the boat. The wind meter shows 17nds [ap. ], but now the backstay wind comes in over port. The main is back, so we have to gybe. We passed. Wind [ap.] 130° over starboard, 13 kn. Here, the waves are far less high. We gybe again. A ferry leaves Antirrio, his bow making an angle of 45° in our direction. But he waits. The small ferry will pass behind us. 1.10 p.m.: Olympia radio forecasts "Variable 3-4, good, thunderstorm soon". Just after 4 o'clock we sail into the channel to the harbour of Messolonghi. We have seen that the weather in Nieuwpoort was and is often better than here (certainly at this time) because here the weather is very unstable and the threats for thunderstorms are following one another. We have had a good weather window allowing us to reach Mesolongi coming from Galaxidi (58 NM, 50 NM thanks to the favourable 0.5 to 1 kn of current. Fortunately this allowed us to get the western Gulf of Patras and to leave behind us the capricious Gulf of Corinth! But unfortunately, now we are blocked at only 59 NM from Lefkas. Days of windy and rainy weather but above all thunderstorms are preventing our progress. A nice day and a good wind - not this strong wind from the North-West, our course! 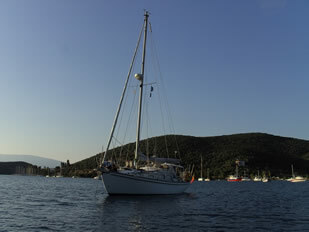 - would allow us to reach Lefkas at once, or to get closer by making a stop at Ithaka. But for the coming days the weather looks too uncertain to take any risk for our small boat! The harbour of Mesolongi is well protected and the developing works have started again; they should be worthy of the coming nice marina thanks to a Greek-Dutch management- and investments (450 berth planned). But and although this is already a progress compared with the situation during our stop last May, only the old pontoons (later on they'll have to be replaced), the brand new office, two showers and two toilets are currently in use. A few terminals for water and electricity have just been put on the quays but at this moment only the water is connected. all the rest exists ... only on the paper! due to the competitive rates many boat owners have already decided to winter their boat here, afloat or ashore. 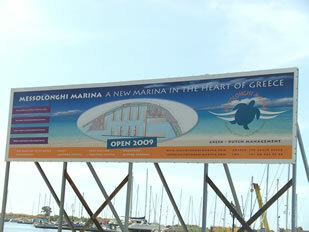 A large panel at the entrance of the marina and a website unveil the ambition of this project www.messolonghimarina.com. 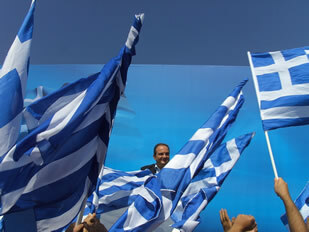 Anticipated elections will take place in Greece on the 4th of October. This afternoon Prime Minister Karamanlis (Nea Democratia, centre right) has visited the future marina and has been explaining the project ... Never before we have seen such a deployment of - (mainly) cleaning - activity, although the result has left us more than skeptical. Mesolongi with his glorious history in the liberation war against the Ottoman Empire, is one of these little towns with high schools. The city is at this end of September very lively and pleasant, but the harbour is at 15 minutes - 5 minutes by taxi for 3 euros! We still have discovered some other restaurants ( f.i. Philoxenia, good food and nice welcome ) and nice terraces ( f.i. Byron café). 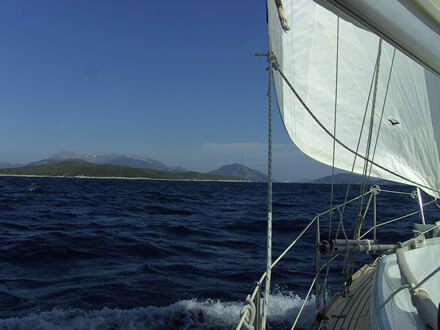 21.09.09: Messolonghi > Vathi (N. Ithaka) 36,6 NM, 08H00-15H45. 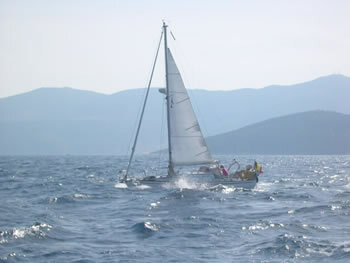 22.09.09: Vathi (N. Ithaka) > Lefkas Marina ( N. Lefkada) 26 NM, 09H00-14H30. We get up early after a little disturbed night: we cannot imagine staying one day more here. But the weather forecast incites us to wait to E 5 to 6Bft, easing and soft and veering SE 4, thunderstorm threatening for Kefallinia and possibly for Ithaka in the early morning (between 6 and 9 a.m.) then sunny. The gribfiles provide further details. So, no hurry. A little later, breakfast in the cockpit. The orange marmalade that we got as a little farewell gift - and some fruit - after our last shower at Hotel Poseidon in Galaxidi, is a real delight, which fits perfectly with the aroma of the Italian coffee. At 9 a.m. We slip the lines. 09.30 a.m. Outside it's again the rough and a little chaotic sea we find and again Nehalinnia runs leaping over the waves new leaves while its crew hopes from Poseidon a little more mildness. We maintain a course to pass windward of Arkoudi island. This seems to be the right option, speed over the ground 6.4 kn while the log shows 5.4 kn. The D. Elias pilot indicates the direction of the currents with a good precision. At last, the sea is easing, the wind is more backward, the waves are not so high anymore and they become more round ..
Late September, but then, how to survive the hell of the month August? Impossible, the most of our sailing friends say. Simply by not being there! At 2.30 p.m. we moor in Lefkas Marina. We are tired. Horto-Lefkas in 27 days. Who said 64 hours? Not for our small sailing boat, and, surely not for us!! Nieuwpoort - Hortó and - already - back to Lefkas: that's what we have realised with our 27 feet sailing boat and its 6,20 m long waterline! Kaat, who steers most of both, can already be proud, Eric says.